For more than 30 years, The Maine Bucket Company has been one of the foremost cedar and wooden barrel manufacturers in the US. Our accomplished coopers are capable of creating most any style cedar barrel. Whether you prefer your custom wood barrels with a natural or custom stained finish, there are endless creative opportunities. 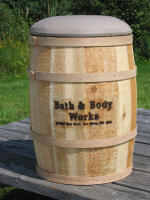 Perfect for displaying bulk goods, produce, and an endless assortment of hard goods, you will find the warmth and unique organic nature of our barrels enhances any product. 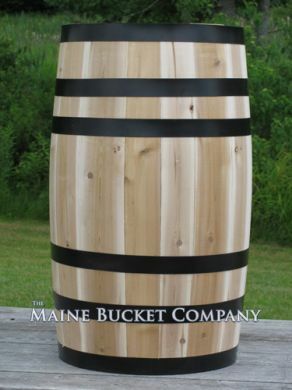 Maine Bucket’s barrel line includes, but is not limited to, display barrels, barrel racks, tubs, custom point of purchase barrel displays and just about any type of crafted custom barrel within your imagination. 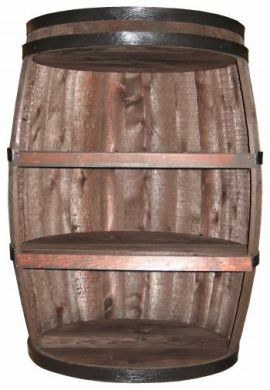 Whether you are looking for stock whole barrels, false bottom display barrels, or custom barrel displays, The Maine Bucket Company is prepared to assist you with your order. We work closely with our customers to provide the best possible products while meeting the necessary objectives of quality, low cost, quick lead time and comprehensive service. Blind drop shipping, order fulfillment, custom shipping cartons, specialized labeling, and PMS color matching also available! Feel free to contact us if you need more information or if you want a design similar to our images for your retail space.